Consider this “no cuts, no color” salon one of the founding fathers of blowout-only shops. 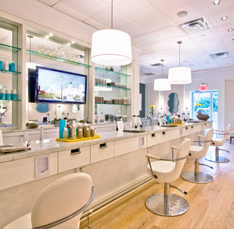 The concept, which has inspired many others, is simple: book an appointment (or just pop in), grab a glass of bubbly, pick a style from the menu of looks (perhaps the sleek and smooth Manhattan or the messy, beachy Mai Tai), and enjoy a wash and blow-dry in front of a chick flick for $40. We recommend adding a $10 Floater (10-minute scalp massage) to your order or purchasing blowouts in packs. Repeat customers should consider memberships, which offer multiple blowouts, Floaters, and products at a discount. There are currently three locations: Highland Park, NorthPark Center, and Plano. No need to call ahead; just book online.